Giovanni D’Amore discusses approaches to characterising both dielectric and magnetic materials using impedance analysers and specialist fixtures. We are used to thinking about technological progress in terms of mobile phone model generations, or semiconductor manufacturing process nodes. These provide a useful shorthand, but overshadow progress in enabling technologies, such as those in materials science. Anyone who has taken the back off a CRT television or opened an old power supply will know one thing: you couldn’t build 21st century electronics using 20th century components. For example, rapid progress in materials science and nanotechnology has created new materials with the characteristics necessary to build dense, high-performance inductors and capacitors. Developing devices that use these materials demands accurate measurement of electrical and magnetic characteristics, such as permittivity and permeability, across a range of operating frequencies and temperatures. Dielectric materials play a key role in electronic components such as capacitors and insulators. The dielectric constant of a material can be adjusted by controlling its composition and/or micro-structure, especially for ceramics. It is important to measure the dielectric properties of a new material early on in a component’s development cycle in order to predict its performance. The electrical properties of a dielectric material are characterised by its complex permittivity, which is made up of both real and imaginary components. The real part of permittivity, also called the dielectric constant, represents the material’s ability to store energy when it is subjected to an electric field. Materials with a higher dielectric constant can store more energy per unit volume than those with lower dielectric constants, making them useful for dense capacitors. Materials with lower dielectric constants make useful insulators in signal-transmission systems, precisely because their inability to store much energy minimises signal propagation delay through any wires they insulate. The imaginary component of complex permittivity represents the energy dissipated by a dielectric material when it is in an electric field. This needs to be carefully managed to avoid devices such as capacitors built using these new dielectric materials from dissipating too much energy. There are various ways of measuring a dielectric constant. The parallel-plate method puts the material under test (MUT) between two electrodes. The impedance of the material is measured and converted to the complex permittivity using the equations shown in Figure 2, which reference its thickness and the area and diameter of the electrodes. This approach is mainly used for measurements at low frequencies. While the principle is straightforward, precise measurements are difficult due to the measurement errors, especially for low loss materials. Complex permittivity varies with frequency and so should be evaluated at the operating frequency. At high frequencies, errors due to the measurement system increase, making the measurement inaccurate. A dielectric material test fixture, such as the Keysight 16451B, has three electrodes. Two of them form a capacitor and the third provides a guard electrode. The guard electrode is necessary because when an electric field is established between two electrodes, part of it will flow beyond the MUT mounted between them (see Figure 2). The existence of this fringe field can lead to a mis-measurement of the dielectric constant of the MUT. The guard electrode absorbs the current flowing through the fringe field, so improving the measurement accuracy. If you want to measure the dielectric properties of a material, it is important that you only measure the material and nothing else. For this reason, it is vital to make sure the material sample is very flat, to eliminate any air gap between it and the electrodes. There are two ways to achieve this. The first is to apply thin-film electrodes to the surface of the material under test. 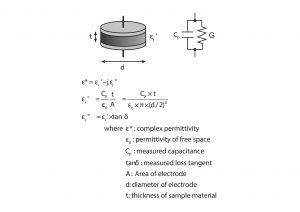 The second is to derive the complex permittivity by comparing the capacitances between the electrodes, measured with and without the material present. A guard electrode helps improve measurement accuracy at low frequencies, but at higher frequencies can have an unfavourable impact on the electromagnetic field. Some testers are offered with an optional dielectric material fixture, which has compact electrodes that extend the useful frequency range of this measurement technique. Software can also help eliminate the effect of fringe capacitances. Residual errors due to the fixture and the analyser can be reduced by open, short and load compensation. Some impedance analysers have this compensation feature built in, which helps enable accurate measurements over a wide frequency range. Evaluating how the characteristics of a dielectric material vary with temperature demands the use of a temperature-controlled chamber, and heat-resistant cables are required. Some analysers are offered with software to control a thermal chamber and heat-resistant cable kits. Like dielectric materials, ferrite materials are steadily improving and are widely used in electronic equipment as inductive components and magnets, and as parts of transformers, magnetic field absorbers and suppressors. The key properties of these materials include their permeability and their losses at the key operating frequencies. Impedance analysers with magnetic material fixtures can provide precise and repeatable measurements over a wide frequency range. As with dielectric materials, the permeability of a magnetic material is a complex property expressed in both real and imaginary parts. The real term represents the ability of a material to conduct magnetic flux and the imaginary term represents the losses in the material. Materials with a large permeability are useful to reduce the size and weight of magnetic systems. The loss component of a magnetic material’s permeability can be minimised for maximum efficiency in applications such as transformers, or maximised for applications such as shielding. 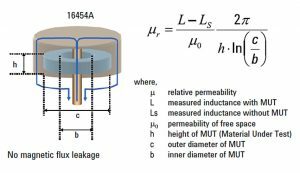 Complex permeability is determined by the impedance of an inductor formed with the material. In most cases, it varies with frequency and so should be characterised at the operating frequency. At higher frequencies, accurate measurements are difficult due to the parasitic impedance of the fixture. For low-loss materials, the phase angle of the impedance is critical, although the accuracy of phase measurements is often insufficient. Permeability also varies with temperature, and so measurement systems should be able to evaluate temperature characteristics accurately over a wide frequency range. Complex permeability can be derived by measuring the impedance of the magnetic material. This is done by winding some wire around the material and measuring the impedance with respect to the ends of the wire. The result may change depending on how the wire is wound and how the magnetic field interacts with its surroundings. The magnetic material test fixture (see Figure 3) provides a single-turn inductor that wraps around a toroid of the MUT. There is no leakage flux in the single-turn inductor and so the magnetic field in the fixture can be calculated from electromagnetic theory. The simple shape of the coaxial fixture and the toroidal MUT enables both precise evaluation and wide frequency coverage, from 1kHz to 1GHz, when combined with an impedance/material analyser. Errors due to the measurement system can be removed prior to measurement. The error due to the impedance analyser can be calibrated by three-term error correction. At higher frequencies, phase-angle accuracy can be enhanced by the low-loss capacitor calibration. The fixture can provide another source of error, but any residual inductance in it can be compensated for by measuring the fixture without the MUT in place. As with the dielectric measurements, evaluating the temperature characteristics of a magnetic material requires a temperature chamber and heat-resistant cables. Better mobile phones, more advanced driver assistance systems and faster laptops all rely on continuous advances in a broad range of technologies. We may measure progress in semiconductor process nodes, but a whole range of supporting technologies are developing as quickly to make it possible to put these new processes to work. Recent advances in materials science and nanotechnology have made it possible to produce materials with much better dielectric and magnetic properties than were available before. Measuring these advances, though, is a complex process, especially because of unwanted interactions between the materials and the fixtures in which they are mounted. Well thought-out instruments and fixtures can overcome many of these issues and bring reliable, repeatable and efficient dielectric and magnetic material properties measurements to users who don’t have specific expertise in these areas. The result should be more rapid deployment of advanced materials throughout the electronics ecosystem.